Kamaroma was established in 2012, with the aim of producing high quality natural skin care products. Our products contain natural plant oils and botanical extracts at optimum levels to produce specific desired effects. We research the benefits of these plant extracts thoroughly before incorporating them into our products and offering them to you. We are continually reviewing new ingredients as they become available and assessing them for potential use in our products. Certified organic ingredients are used when they are available. By supporting organic farming methods, we are helping to sustain the natural eco systems of the earth. In view of the vast destruction of the rainforests in Borneo, Indonesia and other parts of the world to grow palms for the production of palm oil and palm kernel oil, we do not use these oils in our products. We are pleased to be able to bring to you a cold process soap that is 100% natural and is not made using palm oil or any of its derivatives. Our other palm oil free products include: Nourishing Body Oil, Dead Sea Salt Body Scrub, Muscle Ease Bath Soak, Bath Truffles, Bath Melts and Lip Balms. We are also in the process of developing a new range of products that contain a palm oil free emulsifier. Our creams at present contain emulsifiers that have palm oil derivatives that have been RSPO approved. Our bottles, jars and boxes are fully recyclable and we often use recycled packaging for sending our products out to our customers. 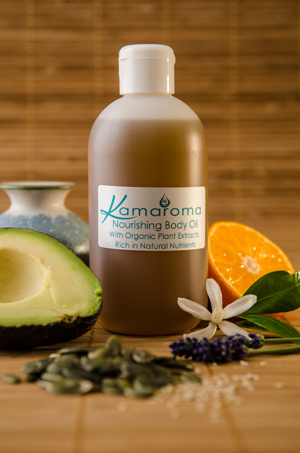 Kamaroma’s preference is to use organic, plant-based ingredients in our products. Some ingredients such as the plant oils, plant extracts and essential oils, have been minimally processed so that they are as close to the original source in their make up as possible. Such processes include pressing, filtering, steaming, carbon dioxide extraction, maceration and heating. These are the most natural form of ingredients. It is unfortunate that some ingredients that are vital in some formulations must go through further processing in order to make them. These include emulsifiers, surfactants and preservatives. The emulsifiers we use are derived from olive oil, coconut oil and palm oil. Emulsifiers are necessary to form creams and lotions from water and oils, which are not normally miscible. We use essential oils to fragrance our products or perfumes created from only natural ingredients. However, as some people are sensitive to some of the components of essential oils, we offer fragrance free options of some of our natural skin care products, allowing these customers to enjoy the benefits of the natural plant oils and extracts contained in our products. In water based products, it a requirement of EU legislation that they contain a preservative and that the preservative system has been tested for efficacy. They are necessary to ensure that the product is safe to use by preventing microbial growth. Although there is a lot of controversy surrounding the use of preservatives, it is far safer to do so than risk causing skin infections, some of which can be serious. Glycerine, Sodium Levulinate, Sodium Anisate; this is an approved preservative system for use in natural and organic cosmetics and is derived from plants rather than petrochemicals. We use it in combination with sodium phytate, a chelating agent, which is also approved for use in organic products. We are currently in the process or working towards all of our products containing only plant based preservatives.